HAPPY DIWALI EVERYONE!!! ALSO MY 200th POST!!! 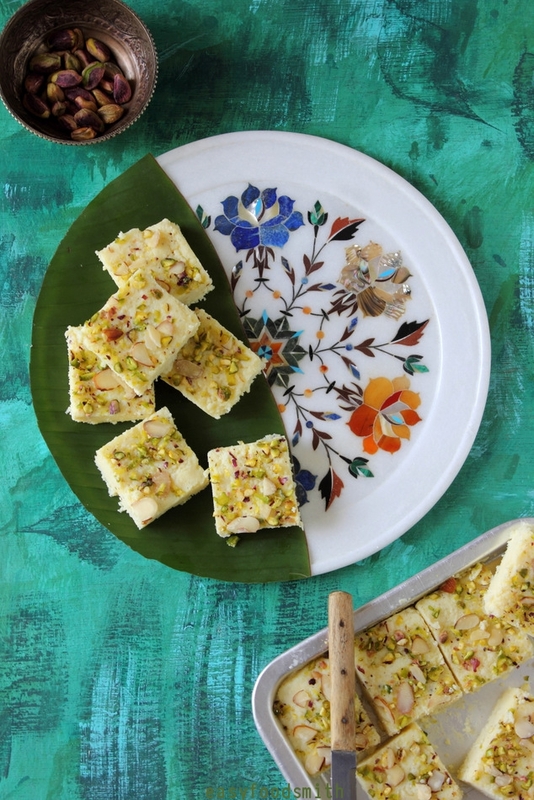 Since mithai shops (sweet shops) or halwai ki dukan is something that is present at almost every nukkad or locality, I wonder how many Indians make the traditional sweets at home. One thing that many expats miss for sure in Indian food is the mithai or the traditional Indian sweets. 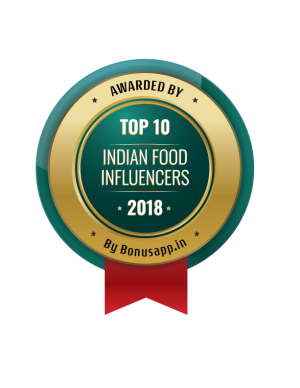 When we were posted in Nigeria, I had no choice but to learn how to make Rasgulla, Kalakand and Gulab Jamun (I made gulab jamuns using powder milk since it is easier and fool proof method) to satiate out desi cravings. However, we are lucky that there is a huge expat Indian community in Dubai, and plenty of options for buying ready made mithai, yet we miss the taste of the mithai of our favourite local mithai shop in Mumbai. Grease a tray with a little ghee and set aside. Put everything in a microwave safe bowl (I prefer to use glass one) and microwave it for a minute. Remove the bowl from microwave and stir together the contents well. And again microwave it for a minute. You will notice everything having come together as a moist milky mass. If you find it has thickened add a few tablespoons of full fat milk (I used 6 measuring table spoons) and stir it in well while the contents are still hot. Decant the contents on to the tray and using a spatula even it out across the tray. 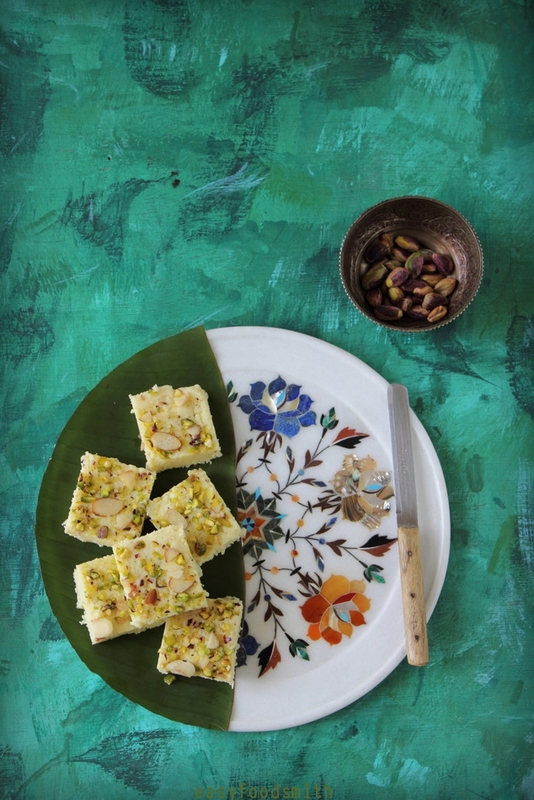 Sprinkle the almond flakes and pistachio all over the kalakand. Cover the kalakand with a cling film. Refrigerate for an hour. 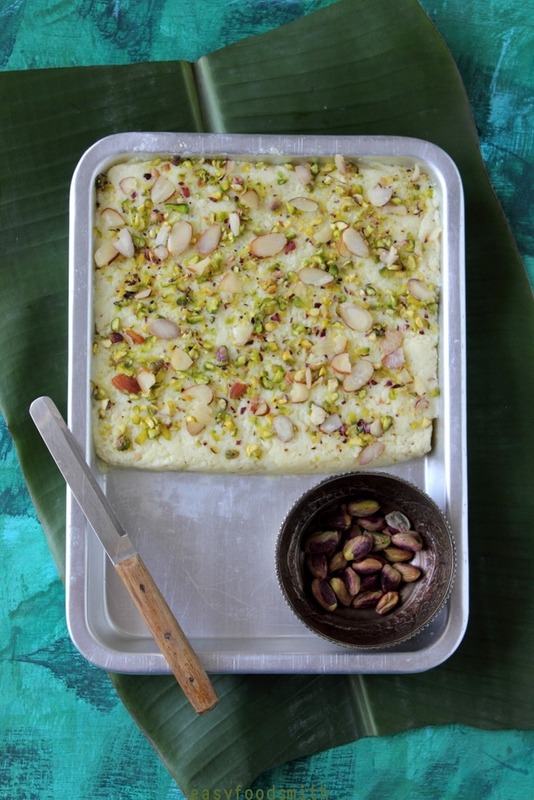 Remove the kalakand from fridge, discard the cling film, and cut it in size and shape of your choice and enjoy! Note: I have used unsweetened milk powder and not baby milk formula. If you are using sweetened milk powder, please adjust the amount of sugar accordingly. Note: Kalakand requires home made cottage cheese since it is fresh and softer in texture than store brought one. Note: Cottage cheese can be swapped with ricotta cheese. Drain ricotta before using it. Note: Ensure that the cling film is touching the kalakand. This will ensure that the top of the kalakand does not dry out when you refrigerate it. Note: Kalakand is supposed to have grainy texture. Therefore ensure that it is really moist when you keep it for refrigeration. If it is dry before you keep it for cooling, the end result will be a very dry almost, burfi like kalakand. Thanks for visiting and see you soon again with another exciting recipe! Happy Diwali to you and your family! This is a beautiful Diwali sweet. Love that you have made this kalakand with milk powder. I’d probably use ricotta in this — rarely make my own cottage cheese for some reason. But do like to make ricotta. Anyway, this looks terrific — bet the flavor is stupendous. Thanks!